The tapestry show[s] the story of the Apocalypse from the book of revelation by St. John the Divine. In the fourteenth century, the Apocalypse was a popular story, focusing on the heroic events between good and evil, and featuring battle scenes between angels and beasts. Although many of the scenes from the story include destruction and death, the account ended with the triumphant success of good, forming an uplifting story. […]In 1480, after the dukes owned the tapestry for a century, the Rene of Anjou gave the tapestry to Angers Cathedral where it remained for many years. During the French Revolution the Apocalypse Tapestries were looted and cut up into pieces. The Tapestry were used as floor mats, to protect local orange trees from frost, to store up holes in buildings, and to insulate horse stables. Featuring painting purposed as rug, Paula Wilson’s FLOORED elevates everyday wear and tear. Wilson’s works are rolled out, splayed, poised, and presented. The texture of the everyday is caught and framed in the moment, where weathered wooded motifs repeat and the ornate Byzantine appears. Works are filled with cacti, gourds, amphora, rocks, fruit, pottery shards, figurines, flowers, and mooning bootys, and they are worn through use and time. Subject matter referenced in FLOORED celebrates the texture, history, and patterns of everyday life. Caught in the game of perception, Wilson asks audiences to contemplate the frame(s) in which art is historicized and viewed—the floor now becomes the wall. With FLOORED, she (re)shifts the narrative of luxury in historical painting by presenting images that become more than just objects for viewing. They shape shift to become things of their own. At Williamson | Knight, Wilson positions her works between the gaze of perception and the abrasion of the foot. This is the contemplation of the space of limbo where artist and audience is both the consumer and user. Paula Wilson is an artist living in Carrizozo, New Mexico. Her work is included in the collections of The Studio Museum Harlem (New York), Yale University Art Gallery (New Haven), Mildred Lane Kemper Art Museum (St. Louis), Tang Museum (Saratoga Springs), and Saatchi Gallery (London). 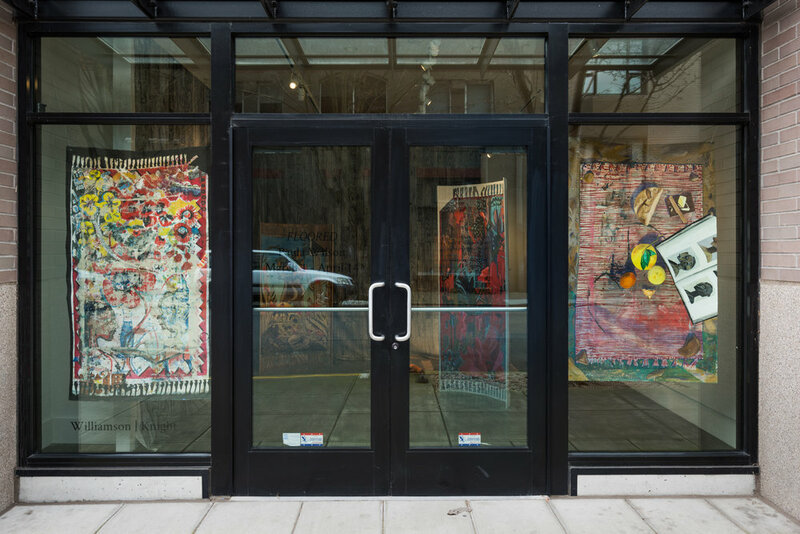 Recent solo exhibitions include: Paula Wilson: The Backwards Glance at The Bemis Center of Contemporary Arts (Omaha: 2017), Salty and Fresh at Emerson Dorsch Gallery (Miami: 2017), Salty and Fresh at Cherry & Lucic (Portland: 2017), Undress at the Center for Contemporary Arts (Santa Fe: 2014), and First Story at The Fabric Workshop and Museum (Philadelphia: 2010). 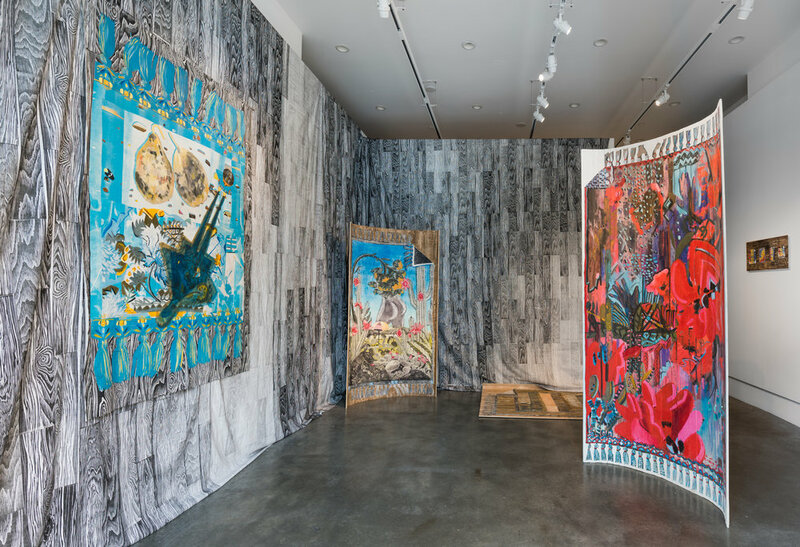 Wilson is a recipient of the Art Production Fund’s P3Studio Artist-in-Residency at the Cosmopolitan in Las Vegas (2014), the Joan Mitchell Artist Grant (2009), and the Bob and Happy Doran Fellowship at Yale University (2009). She holds a Masters of Fine Art from Columbia University and presently co-runs the artist-founded organization MoMAZoZo and the Carrizozo Colony in Carrizozo, New Mexico.